High Court sitting in Osogbo has adjourned ruling on interlocutory injunction seeking to set aside the election of Senator Ademola Adeleke as PDP governorship flag bearer. Two members of the party, Rasheed Olabayo and Olusegun Idowu had approached court over issue relating to Adeleke’s secondary school certificate which he allegedly submitted to the party to contest the party’s ticket. The applicants asked the court among other things to stop the Independent National Electoral Commission (INEC) from accepting the name of Senator Adeleke as the party’s candidate in the September governorship election. After listening to the submission of counsel to the plaintiffs, Barrister Olufemi Ayandokun, the presiding judge, Justice David Oladimeji stated that he had to study the bulk processes filed by the applicants to be able to give ruling on the matter. He thereafter adjourned the matter till tomorrow, Thursday, 2018 for ruling. In a suit filed on Monday, July 24, 2018, the plaintiffs sought an interlocutory order setting aside the election of Adeleke who was the first defendant in the matter, arguing that he did not satisfied the constitutional requirements to contest the governorship election. In a separate 29-page affidavits of extreme urgency deposed to by the two applicants, Rasheed Olabayo and Oluwaseun Idowu with several exhibits attached, the duo claimed Senator Adeleke did not possess School Leaving Certificate as required by Section 177 (d) of the 1999 constitution. While urging the court to restrain the PDP from submitting and presenting his name as governorship candidate in 2018, they also asked the court to stop INEC from accepting his nomination. The plaintiff also attached a copy of Adeleke’s detailed results by subjects of the examination conducted by the West African Examinations Council General Certificate of Education Ordinary Level May/June 1981 at Ede Muslim Grammar School, Ede with Centre No. 19645 and examination number 149. Olabayo claimed in his affidavits that, “I know as a matter of fact that the 1st defendant attended Ede Muslim Grammar School, Ede but did not leave with a School Leaving Certificate having absented himself from the school leaving examinations but for English where he scored a failing mark of F9. 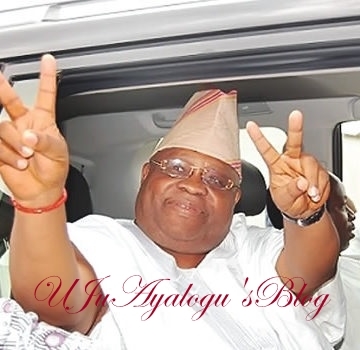 They claimed that if the Adeleke name is presented, their party the PDP will be disadvantaged and left without a valid and eligible candidate given that he did not possess a School Certificate Level Education and thus lacks the requisite qualification to be “so presented let alone contest the 2018 Osun State Governorship Elections”. In his written address in support of the motion on notice and the originating summons, the applicants’ lawyer, Barrister Olufemi Ayandokun cited relevant laws and authorities, he urged the court to grant the plaintiffs prayers, saying no injustice will be done the defendants if the application is granted “but rather the course of justice will be better served”.